In the world, more and more technique is being developed - the technique of how to influence people through propaganda, through compulsion, through imitation... Should not the mind always be in revolt so as to understand the influences that are always impinging, interfering, controlling, shaping? Is it not one of the factors of the mediocre mind that it is always fearful and, being in a state of confusion, it wants order, it wants consistency, it wants a form, a shape by which it can be guided and controlled... Must not the mind have the capacity to fathom - not to imitate, not to be shaped - and to be without fear? Should not such a mind be alone and therefore creative? That creativeness is not yours or mind, it is anonymous. That prescient warning of the dangers of epistemic closure came from the Indian writer and philosopher Krishnamurti. When I mixed John Cage's Zen practice with Catholicism several years ago a Catholic priest friend warned against "throwing everything into the masonic melting-pot of 'religiosity'". Yes, superficial Oprah-religiosity has its dangers; but increasingly I find myself thinking that although Krishnamurti, Gurdjieff and others may not have seen the light, at least they saw common sense. Edmund Rubbra sampled the masonic melting pot before returning to his Catholic faith and he attended a Theosophist camp in the Netherlands led by Krishnamurti in the period before the Indian teacher split with Theosophy. As a composer Rubbra had the capacity to fathom and not to imitate or be shaped. His Passion setting, Symphony No. 9 Sinfonia Sacra, which was first performed on Good Friday 1972, provides an Easter soundtrack. If you do not know the Symphony listen to the closing pages here - if time is limited fast forward to 5.00". A viewer comment on that YouTube video says "This one work alone makes him a great composer". 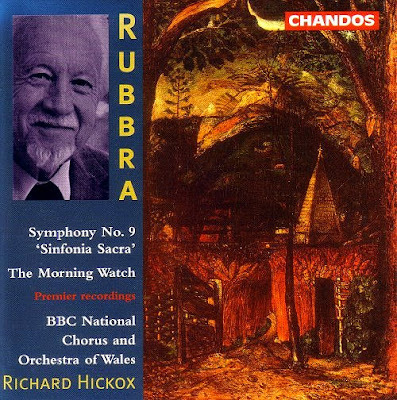 Which leaves nothing more to be said other than that Rubbra's Sinfonia Sacra features in my early post The Year is '72. The header quote comes The Book of Life - Daily Meditations with Krishnamurti which contains a suprising amount of common sense between its covers. All resources were, as usual, bought by me. Any copyrighted material on these pages is included as "fair use", for the purpose of study, review or critical analysis only, and will be removed at the request of copyright owner(s). Report broken links, missing images and errors to - overgrownpath at hotmail dot co dot uk Also on Facebook and Twitter.